Font Works is a great software, worth every penny it has great designs and will save you alot in the long run. Hello, I have 3 machines: Brother PE-8500, old Artista 180 and Deco 340. Have been using Amazing box for years. Got a new Win 8 computer and the box doesn’t work anymore. Contacted Amazing box manufacturer and they ‘ve recommended Ultimate box from Vikant http://vikant-emb.com/ . I will appreciate your advice. From what I have read, the Ultimate box appears to work the same way as the amazing box. It does work with the latest version of windows and Mac. I have not used it, but it should solve your problem. I am sure that the Amazing Box is no longer being made, because the newer embroidery machines read USB flash drives instead of programmable cards. It is good to know that there is someone still supporting those older but great embroidery machines. Have you tried running in Compatibility Mode to trick the software to think it is an older operating system? Very generous giveaway and great motivation for all !! Can I ask for some advice on the FTC-U? I’m new at using the program. I was using PE-Design Next but the Auto Digitizing Wizard in FTC-U drew me in. I’m not sure of the density for the stitches. In PE-D I read 145 was a great setting and it worked very well for me but FTC-U uses mm and I am so confused! Can you please help me? What’s the best density setting? Thanks a bunch! Wanda, In FTCU, the typical density for a fill stitch or a satin is .50 mm. To decrease the density, use a higher number. To lower the density use a smaller number. I hope that helps. If not let me know and I can provide more information. 1 mm is approximately 0.040″ or 40 thousandths of one inch …hope this helps. I sold my old Bernina Artista 730 (it was a dog), and own Bernina Designer Plus v7 software. I bought 3 new Babylock embroidery machines. I find Designer Plus to be less “friendly” to my Babylocks and am wondering if I should sell my relatively new Designer Plus and buy a different software. Floriani seems to have the best training and support. But I understand Babylock is coming out with new software called Creator. Any comments would be appreciated! I am so sorry for the late reply, Betsy. If you want to create designs for your Babylock Embroidery machines, I suggest Floriani FTCU. It has the best training available with many online classes and additional resources such as the Workshops created by Trevor Conquergood. Floriani also offers FREE upgrades. That alone is a hugh savings. Bernina charges for their embroidery software upgrades and they just released version 8. Not sure what the cost of that will be. Baby lock Designers Gallery offers creator, but it is a very very basic. You would be much better off selling your Bernina software and getting Floriani. Sew Vac Outlet (Humble Sewing Center) is hosting a Floriani event soon. If you can attend you can see the software for yourself. If you cannot attend then, talk to someone at the store. They can give you a demo. Have fun with your Babylock embroidery machines. Is it advisable to use a bottom of the line embroidery machine with a top-notch brand like floriani.I have a pfaff creative 1.5. I want to do my own designs and have the ability to embroider digitized photos. I use FTC/U to digitize and resize the digitized artwork to have it embroider on my Brother PE-770 embroidery machine. However, I am having issues where the finished result on the fabric will have a gap between the white circle and the black outline of the circle even though program will show the stitches overlap each other. I’m not sure how to remedy this issue. Any thoughts would be appreciated. I’ve never had this problem with my mother’s singer futura CE-250. Thank you for taking the time to read this :)! There is finally an inexpensive software out there. One I wrote for a hobby. I would be interested in what you think of it. It can do many things and alot of people already like it. Jim, I would be interested in reviewing your softwarr. Please contact me. You can download the software on embroiderywaresoftware.com/shop. Look for the trial version or you can contact me directly at support@embroiderywaresoftware.com and we can discuss what you need for the review. Mark, Thanks for your feedback. Hi I’m looking for a good software that will do photos more realistic than the pe design 10. Floriani Total Control U has a similar function but I have not seen the results first hand. Try an internet search for pictures or a video of this software. Greetings! Really beneficial guidance on this informative article! I also know something little about the Embroidery Designs and also what is Custom Digitizing. Because sometimes I am facing issue with this. By the way, thanks. How does Wilcox Hatch embroidery software compare to those you have listed and compared ? Thanks for sharing such beneficial information. 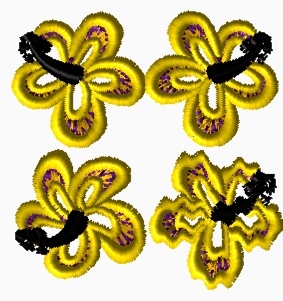 I am also an embroidery digitizer and I appreciate your efforts. Have a look at my Quality Digitizing article.